The iSpecle Camping Hammock is a jungle-style hammock with an integrated, zippered bug net that uses very thin tent poles to quickly and efficiently pop-up the bug netting above the hammock. The ends are gathered with simple rope loops and a large stuff sack is sewn on one side. The hammock body is made from a single piece of fabric. A zipper is attached to one side and runs along the edge. The poles are permanently attached inside reinforced channels. The hammock can be flipped over and used in a netless mode without any damage to the netting or hoops. Have you ever used one of those windshield sun screens for your car made from wire hoops? The iSpecle hammock works much the same way, only the wire is only a half hoop. Still, by twisting the wires, the “hoop” collapses and can slide easily into the stuff sack, just like the sun screen. The great thing about the wire “hoops” is that setup is quick and easy. No additional guy lines are necessary and the interior space is large and open. The concept is solid, but I do have a few misgivings about the design. First, at just 9 feet long, the hammock is a bit short. 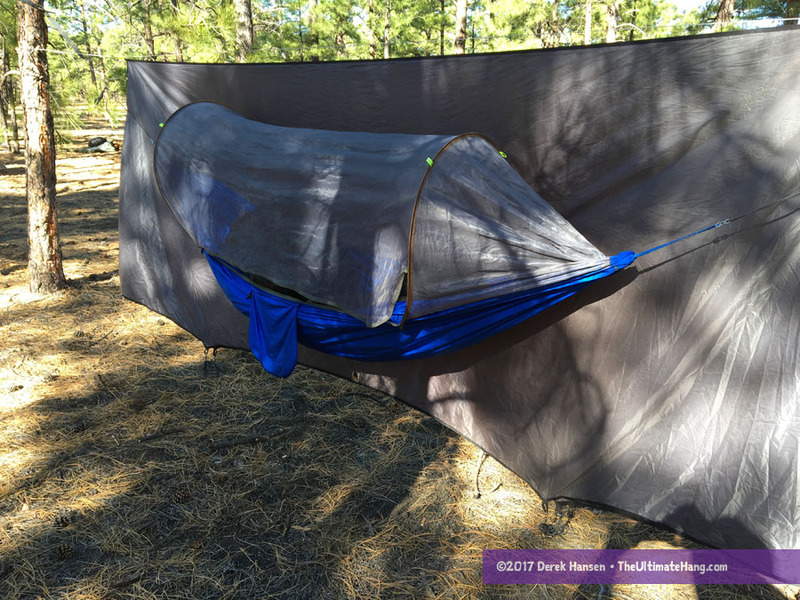 This makes it a little difficult to lay diagonally unless the hammock is hung at a fairly shallow angle, and even then, my feet were pretty tight against the side. For this reason, I would only recommend the hammock for anyone less than six feet tall. Second, the zipper is also a little short, opening only the area between the poles and just up on one side. This constricted the opening for a me and made me worry about potential long-term damage due to the stress points. Last of all, the straps were pretty short. At just over six feet long, that’s about half the length of most typical strap systems. In my area, finding small enough diameter trees that were close enough together was a bit of a chore. To test this hammock in the field, I had to use different suspension in order to make use of the straps. That said, the straps are well-made and use thick seatbelt-style webbing with reinforced loops. If they were only longer, they would have more utility. I would recommend this as a youth hammock, perfect for scouting events or those just experimenting with hammock camping. The integrated bug netting design with the wire “hoops” is a great idea and it makes it perfect for those who want a no-hassle hammock set-up. I appreciate that the hammock came bundled with straps and carabiners, but I would recommend that you use some extender rope or strap to make use of the stock straps. Suspension and Anchor System ♥ ♥ ♥ ♥ ♥ The included strap set and carabiners are solid, but the straps are short. Construction and Craftsmanship ♥ ♥ ♥ ♥ ♥ Mass-market construction, some loose threads. Unfinished interior. Modularity ♥ ♥ ♥ ♥ ♥ The ability to set up quickly and easily and even flip the hammock to “open” mode makes it very versatile. Aesthetics ♥ ♥ ♥ ♥ ♥ Available in a single-color. Price and Value ♥ ♥ ♥ ♥ ♥ Value-priced jungle hammock. Imported. Sounds like an inexpensive version of a Clark. Have you tried pahaque bridge hammocks? No. Send me a link and I’ll check them out. I really like hammocks when camping. This hammock seems average, but I wouldn’t mind using it. I somehow ended up with one of these. I’m just getting my boy into backpacking and have been looking at putting a bug net on his hammock when we were given one of these. After a couple uses I found a number of other issues with it. I’ll be replacing the suspension, putting in a ridgeline, some tie-outs, and a few other things. The bars that keep the bugnet up off your face need some work. The snaps are a bit of a joke and wear out quickly, but with some work and some MYOG knowhow, it’s not bad. For almost $70 I can make something much better, but not having to buy one is a good head start. Would I spend $67 on it? Not a chance. Yes, good call. It’s one of those hammocks that teeters on that value scale. I’m quite new to the concept of using a hammock instead of a traditional tent. What happens in bad or wet weather where one is used to go sit inside the tent while waiting for the bad weather to clear? I guess in a hammock that is still possible but then would probably need to be sleeping to not go crazy, right? I guess it all depends on conditions. Tents are notoriously cramped, and sitting out a storm can be just as problematic. With a hammock, your shelter would be a tarp, and depending on the size (something you can customize to fit your needs) you can have a palace of space to move about in, with friends! You can pitch the tarp high enough so you can walk around under the tarp, or snug it close for as much privacy and protection as needed. Another advantage of a hammock in a storm is that your hammock can convert into a lounger or chair so you can hang out in style, not balled up or cramped up like in a tent. Yes, you can lay down in a hammock, but most hammocks today have zippered bug nets so you can open them up and get more utility from them. And if you happen to be camping in a campground that floods when it rains, why would you want to be in a tent? Stay above the rising tide in your hammock and wade out the storm. This is now selling on Amazon for about half the price you quoted. So, I may pick one up. Could this hammock be staked down to the ground for an improvised bivy style shelter?